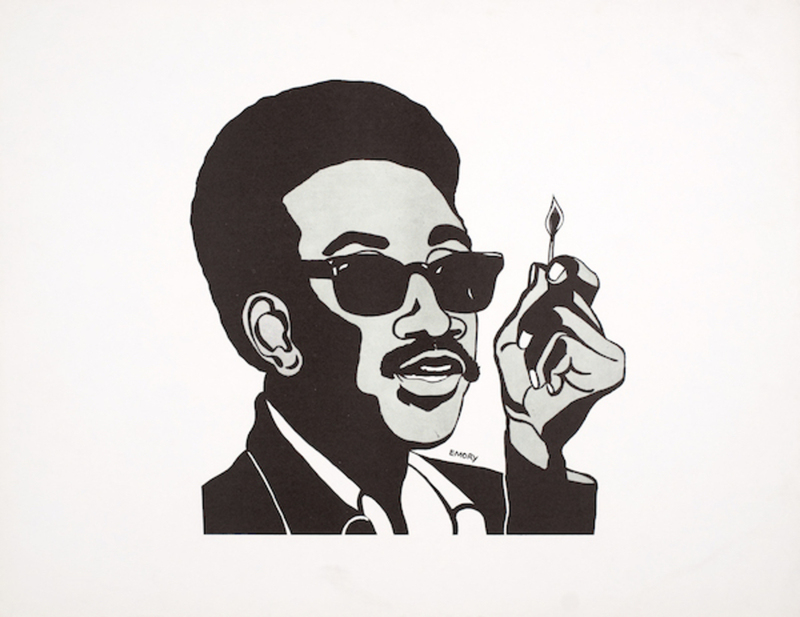 Emory Douglas, H. Rap Brown (Man with Match), 1967, screenprint, 17 x 22". Emory Douglas is a San Francisco–based activist and artist best known for his work as the minister of culture for the Black Panther Party. Through his work with the Panthers’ newspaper, Douglas was able to communicate powerful messages via simple means, creating some of the most iconic images of Black Power. His work will be a part of “All Power to the People: Black Panthers at 50,” which is on view at the Oakland Museum of California through February 12, 2017. In conjunction with Artforum’s “Artists on Politics” feature in the November issue, here Douglas discusses the possibility for change in light of current events. WHAT I ALWAYS STRIVE FOR in my work is to engage people. I think it was Amílcar Cabral, an African revolutionary, who once said, “You have to be able to speak in a way so even a child can understand you.” I contemplated that and decided you even have to draw in a way that a child can understand you, so you can reach a broad audience without losing the essence or meaning of your work. In regard to my work with the Black Panther Party, it wasn’t that the art came through me or by me, but it was a collective interpretation and expression from our community. For me, political art is interconnected with the artist’s lifestyle. I’m quite sure other parts of artists’ lives are a reflection of their work. If there’s not an awareness through observation and knowledge about the subject matter that you’re dealing with, the emotion of a work and how you can express these issues is very limited. There are so many artists working with very different subjects today, and the context of how you see the social and political significance of that has to do with a sense of history. Some artists know nothing about the background of the art of the antiwar movement—art against the war in Vietnam, the Bay of Pigs in Cuba, fights for self-determination in Africa, Asia, and Latin America, all kinds of amazing political works. In being able to see that documentation, young people can gain insight and understanding of the relationship between politics and art and be inspired to explore different options in how they approach politics in their work. For example, with groups such as Black Lives Matter—I have no critique of what they can do at this time, but they’re most certainly having an impact—other Panthers have had meetings and discussions with them. I think there’s always been an interest in the BPP, but before, you had to rely on the mainstream media for your information, and now with the Internet you can reach hundreds of thousands of people directly. In terms of change, it’s going to get worse before it gets better. It’s psychological warfare we’re dealing with, and movements like Black Lives Matter and Occupy Wall Street come out of repression and exploitation. It gets to a point where it explodes, bringing about a consciousness for people who once thought everything was OK. This is true particularly for young people. People used to think, when a young person’s been shot by the police, they must have been doing something, but now they realize that’s not the reality. Today we live under an illusion—spending billions of dollars a week on war, and the government is trillions of dollars in debt, you have to look at it for what it is. You have the illusion of jobs, but there are no jobs in this country. There are the working homeless and people without access to basic resources. You have class struggle going on. They’re always going to try to give you the illusion by opening it up to some people—they have jobs. We have to come together in a way to solve these problems and perhaps we can have a wholesome quality of life. The prison industrial complex, climate change, all those things are in the political environment, where neither of the two parties serves the interests of the people. That’s been exposed, and there’s the real challenge.